There’s something magical about being next to water at first light on a cold, frosty morning. However I think it’s the sort of magic that only a keen angler will appreciate! The actual venue isn’t really important, it’s the water that counts, but on this occasion it was my local canal. If you fish as much as I do then you need places to visit that are on your doorstep, particularly if you do lots of short sessions. And remember it’s better to fish a short period at the right time than spend hours and hours when it’s not. And with a four-hour dawn onwards session planned I was confident. You can view some of the fishing in the accompanying video. I had a steady trickle of fish with the biggest being the one on film. The others were all just a few ounces. I float-fished a worm on a size 10 hook over red maggots. 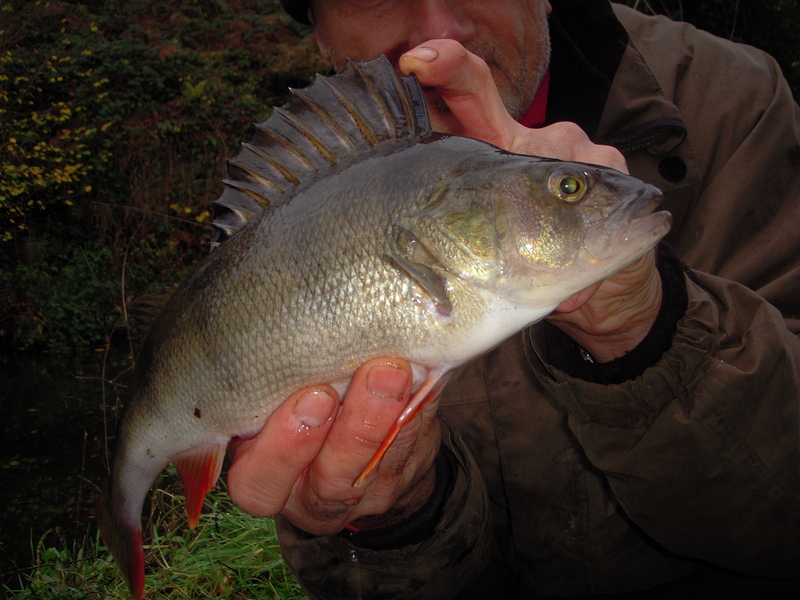 Simple but very effective for perch. Although the Staffs/Worcs Canal is a well-used boat highway, and therefore vegetation regularly hacked by the powers-that-be, nevertheless nature always bounces back. One of the best features to search out is far bank overhanging vegetation. If there are any big perch around they won’t be far away. I’m really keen on the British nature scene, so when flicking channels one afternoon I came across a Commons live session on the ash tree disease, I put the remote down. There were only a few MPs there but it was very interesting and Conservative, Green, Labour and Liberal back-benchers all put in some very valid and educational points. Then the Labour front-bencher got involved and it was all downhill. He wasn’t interested in saving the ash tree, all he wanted to do was score political points and attempt to belittle the opposition. It reminded me why I don’t get involved in the ‘angling scene’. I switched channels after five minutes. People with vendettas and agendas trying to get one over on someone else. Not that I think angling politics is wrong, just that it’s not for me. I totally respect the multitudes of ‘good guys’ that get involved with a pure heart. It’s the ones on the path of impure motive you have to watch that’s all. There’s a difference in being involved in politics and becoming a political animal. My next cluster of sessions were again on the canal. I fished a section on my first outing where I have done well in previous visits. I also decided to go for a prawn approach. I didn’t get a tap. But when I put a bunch of red maggots on I had fish every time. But I decided to stick with the prawn, albeit on one rod while the other presented a worm. And that was the tactic for the remainder of the sessions. But although the latter produced, the former tempted nothing. Both rods were fished to the far bank and were identical in everything except bait. You can see from the photograph as well that I switched to a leger approach. Not only could I get closer to the overhanging vegetation on the far side but it was easier to fish through the leaves. Severe storms had pretty much stripped all the leaves and of course they carpeted the canal. Although I didn’t blank at all, the fishing itself was a bit of a struggle. Mind you the conditions didn’t help even if only in terms of presenting a bait. Gale force winds and torrential rain made things difficult at times! In fact I had to wait until session 5 of the week before I caught something decent. Another first light outing, it was right at the end as I was beginning to break camp when one of the alarms sounded. A very brief but determined tussled followed and the result was the fish you can see in the photograph above. A reasonable fish but even more valued due to how tough it had been. I really felt like my perseverance had been rewarded. And of course, if you’re a regular reader of my Angling Journal, you don’t need me to point out the relevance of fish weights in relation to the venue. With the temperature on a downhill path I thought that was going to be the last perch session of the week before I switched my focus to roach. But with just a few hours around lunchtime available to me I managed to sneak a final outing in. Better to fish for three hours than not fish at all. On the subject of water temperatures, check out the video in this week’s offerings. I think it could become a great resource for anglers. But even if it doesn’t take off I will be posting all my readings from now on under the hashtag #watertemps. I will also put them on my facebook page, emailing them from the water’s edge via my phone. We’ve got the technology so why not use it. So, how did my final perch session go? Temperature was down from 7.4C to 6.7C but it did rise to 6.9C and that in itself is a good reason to take temperatures as we can observe trends even during individual outings as well as over a period of time. The fish still played hard to get though and no biggies obliged but at least I didn’t blank.